I had published entire report about my blog for the year 2012 and it received great response. Also it helped me reflect on how this blog was doing and how could I make this blog better. So, I am making this a monthly event and would publish Traffic and earning report after every month end. Around 41 thousand people visited Apnaplan.com in January 2013 leading to around 71 thousand page views. I had set up target of 1 Million page views for 2013. To reach that I need average monthly page view of around 85,000. I was short of this target this month but good thing is it is 33% more from December. I hope it turns out better for next month. 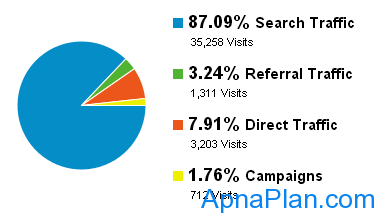 Apnaplan.com got about 87% of traffic from search engines. This is same as it was for earlier months and is good news. Below is the breakup of traffic sources. I had written 41 posts on ApnaPlan.com in January 2013. I am satisfied by this and hope to continue with the same pace. The Alexa traffic Rank as of today is 136,356, while the website is ranked 14,894 in India. This is good for 21 month old blog. As of today there are 1,121 subscribers using feedburner. Its a good news as we added 255 subscribers this month. The Facebook page of Apnaplan.com has 108 Likes. This month 18 new readers liked us. Its encouraging but I am surely looking for more :). As of today I have only Infolinks on the site. As I said earlier, this is not a great revenue generator and has generated USD 41 in Jan 2013. I had removed Infolinks for a week to check how it impacted the traffic, readership experience, etc. I would soon publish my findings on the same. Also I got $ 40 in direct advertisement. So the total earning for Jan 2013 was $ 81. I applied for Google Adsense but was denied citing the following reason – “site does not comply with google policies”. The reason is as vague as it can be and I tried looking for answers but am not able to fix this till now. If anyone can help me let me know.